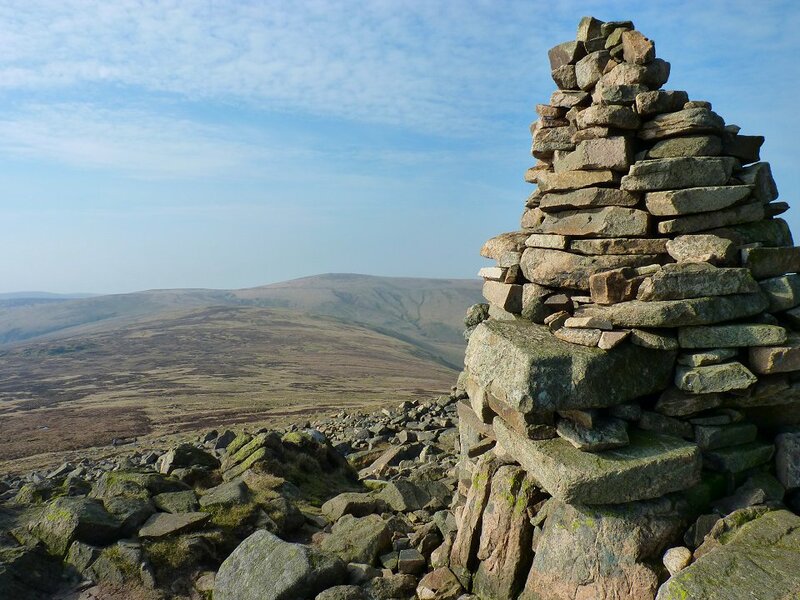 24th-26th March 2012 - A tour of the Northern Fells. Route. 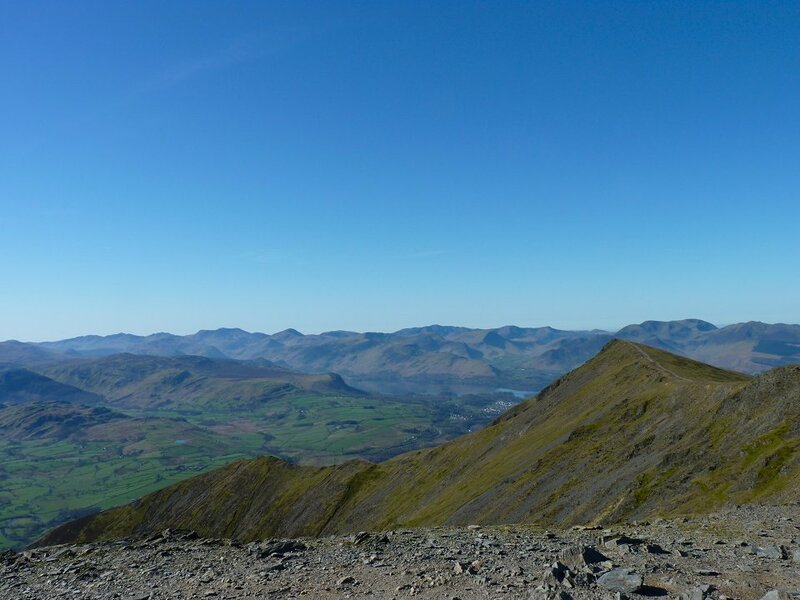 Day 1 - Ravenstone hotel - Ling How - Ullock Pike - Long Side - Carl Side - Skiddaw - Skiddaw Little Man - Skiddaw Lesser Man - Lonscale Fell - Burnt Horse. 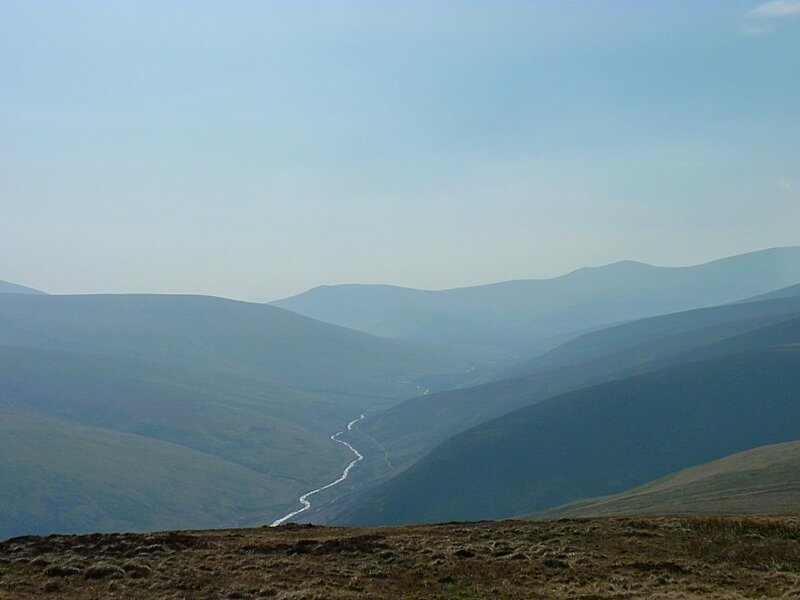 Day 2 -Burnt Horse - Mungrisdale Common - Bannerdale Crags - Bowscale Fell - River Caldew - Round Knott - Carrock Fell - Mungrisdale - River Glendermackin. 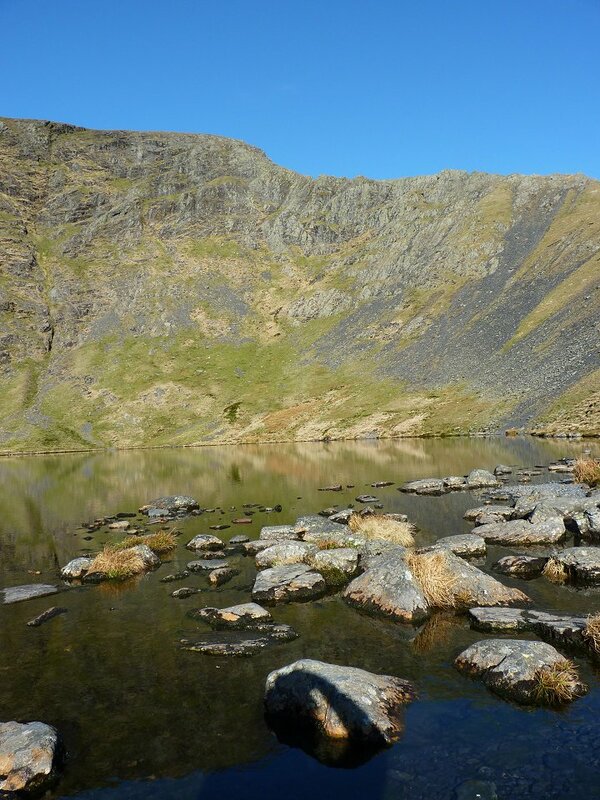 Day 3 - River Glendermackin - Souther Fell - Scales Tarn - Sharp Edge - Blencathra - Hall's Fell Ridge - Threkeld. Looking up the path from behind the hotel. Looking in to the sun and up to Ullock Pike. 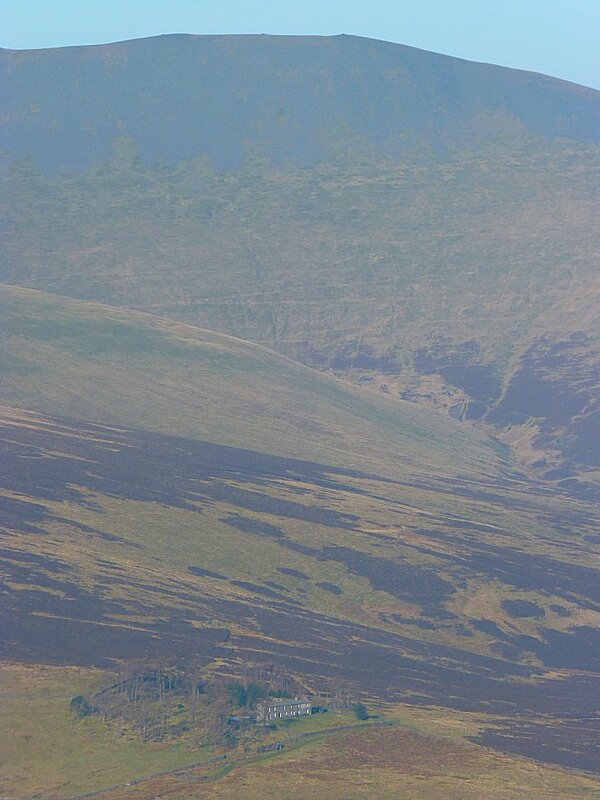 Long Side behind Ullock Pike. 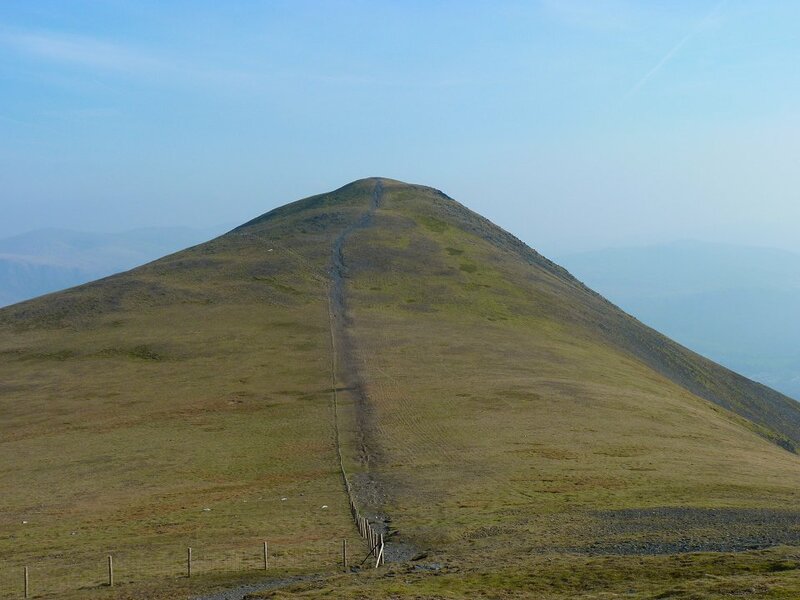 I think I set the record for the slowest ever ascent of Ullock, but I was only going about 6 miles and had all afternoon to do it. 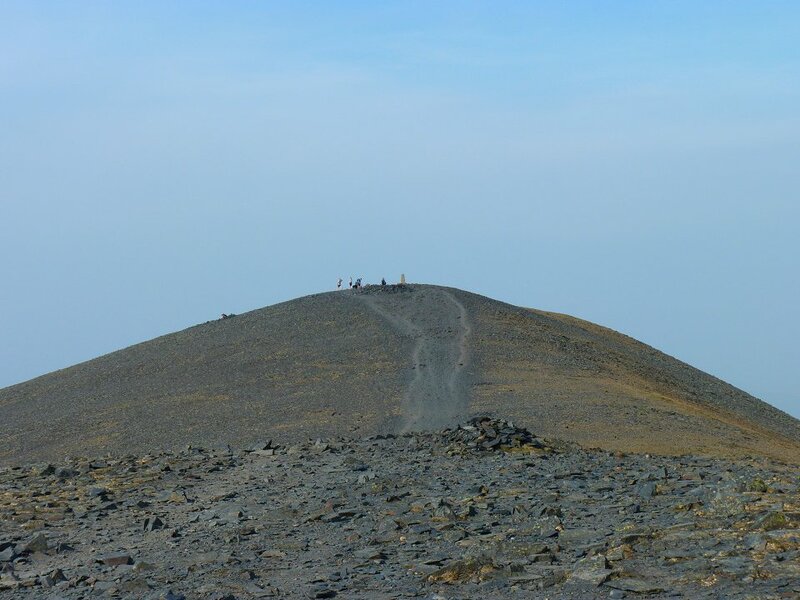 The going gets a bit easier once over Ullock Pike and I was soon at Carl Side. 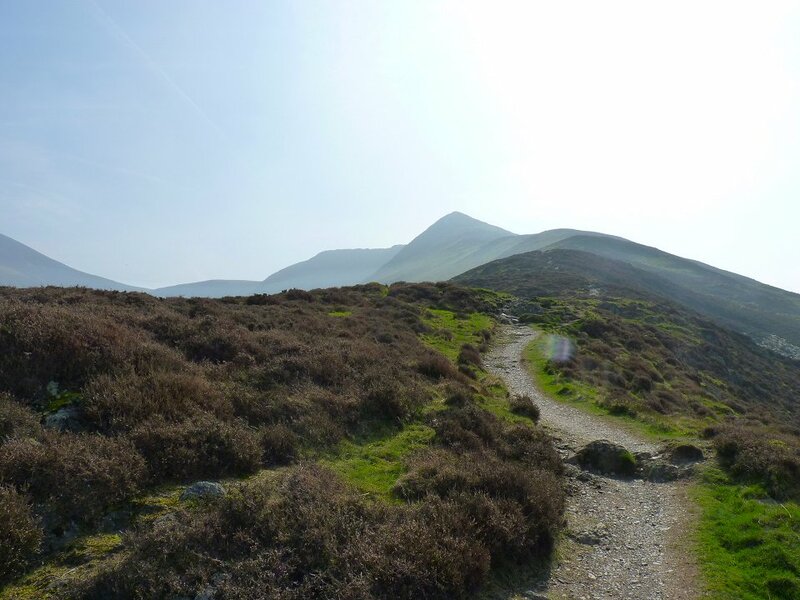 The scree path up to Skiddaw looks inviting ! 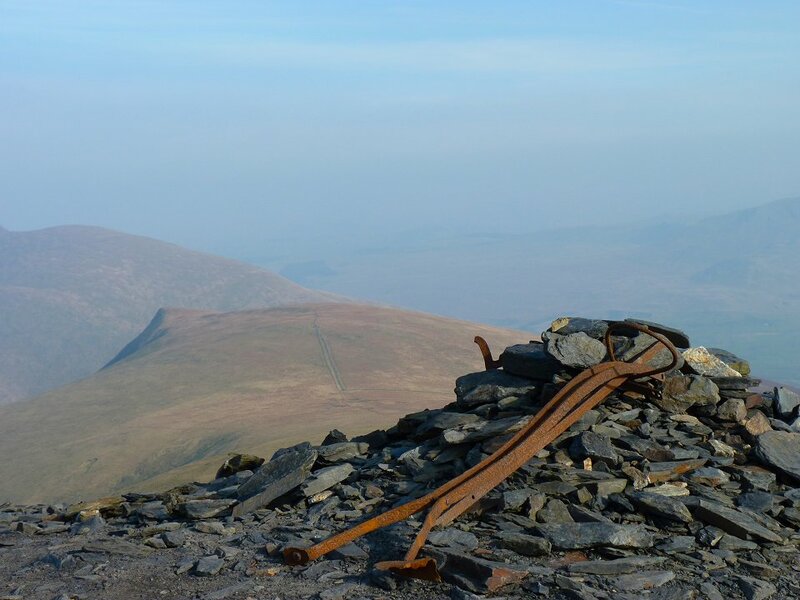 Once I had visited Skiddaw I dropped down and followed the path to Skiddaw Little Man. 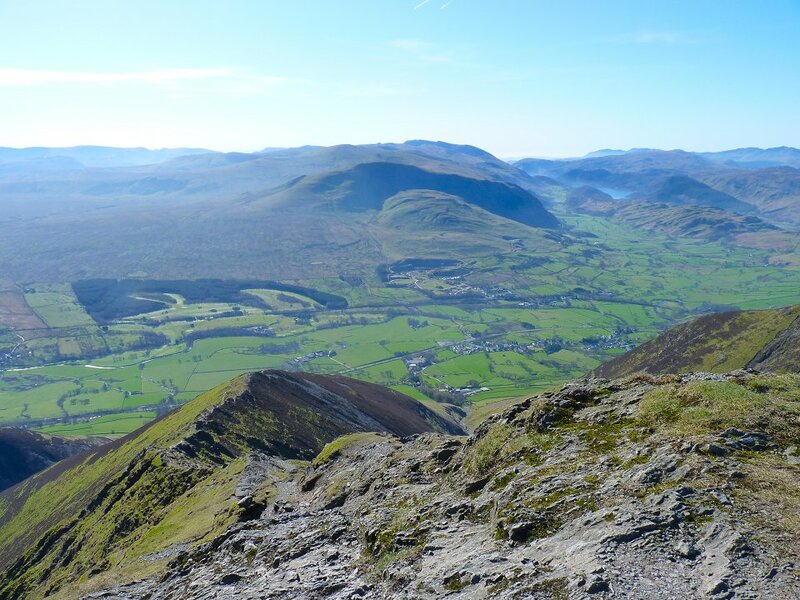 Looking down to Lonscale Fell from Skiddaw Lesser Man. 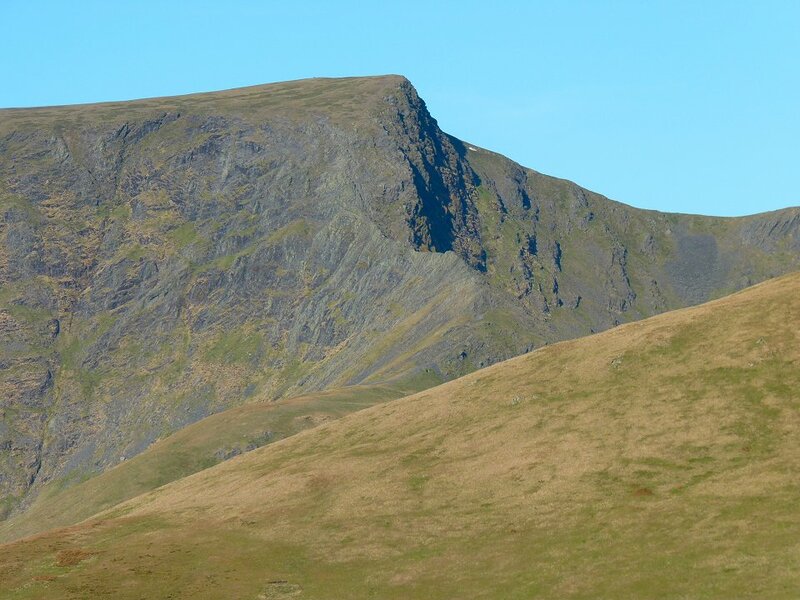 The East Ridge of Lonscale Fell from the drop down to Burnt Horse. 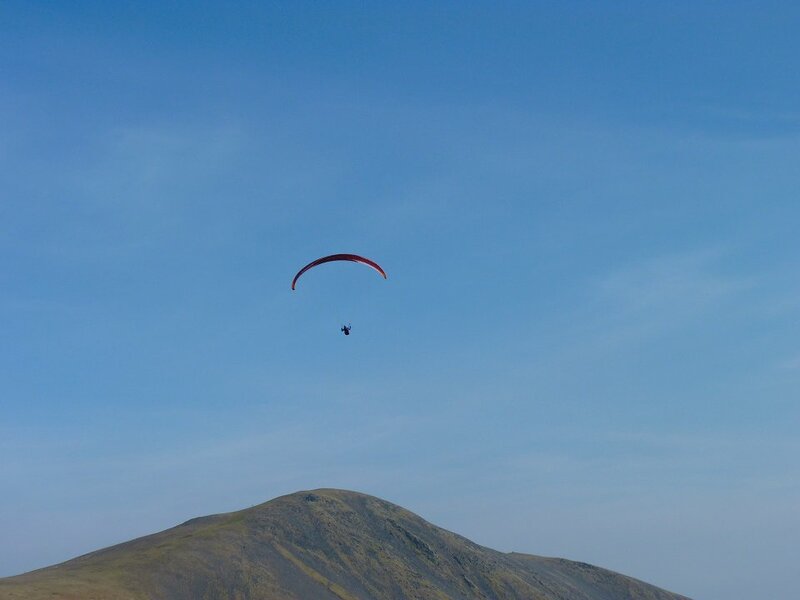 ... and rises over Blencathra. 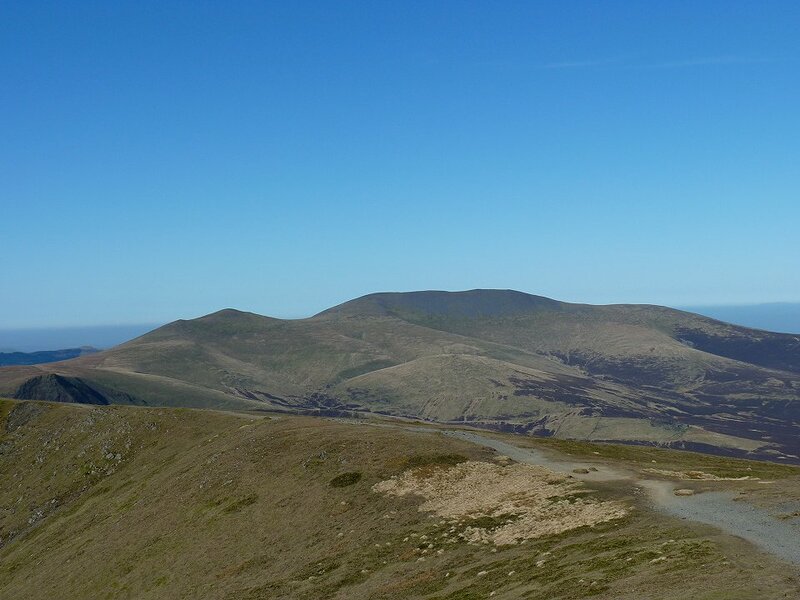 Looking down at Skiddaw House nestled beneath Skiddaw. On Mungrisdale Common now. 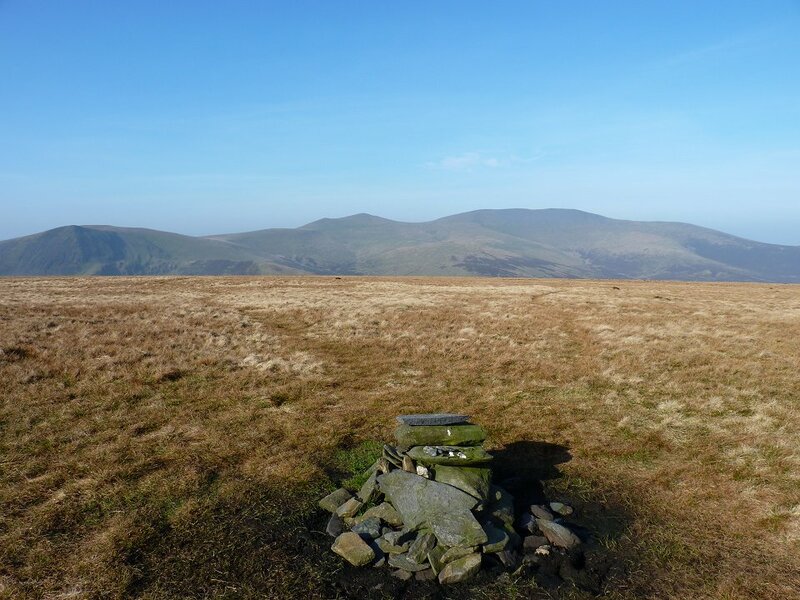 Some people have a low opinion of Mungrisdale Common but on a nice day the views are pretty good. 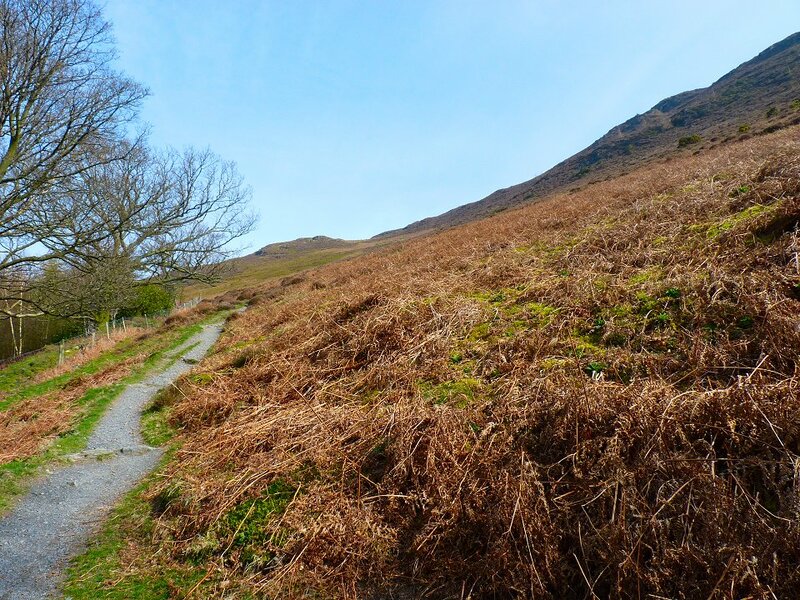 From the Common I headed round then up to Bannerdale Crags. The East ridge looks an excellent way up and is on my "to do" list. After passing over Bowscale Fell I headed down the steep slope to the River Caldew passing above Bowscale Tarn on the way. 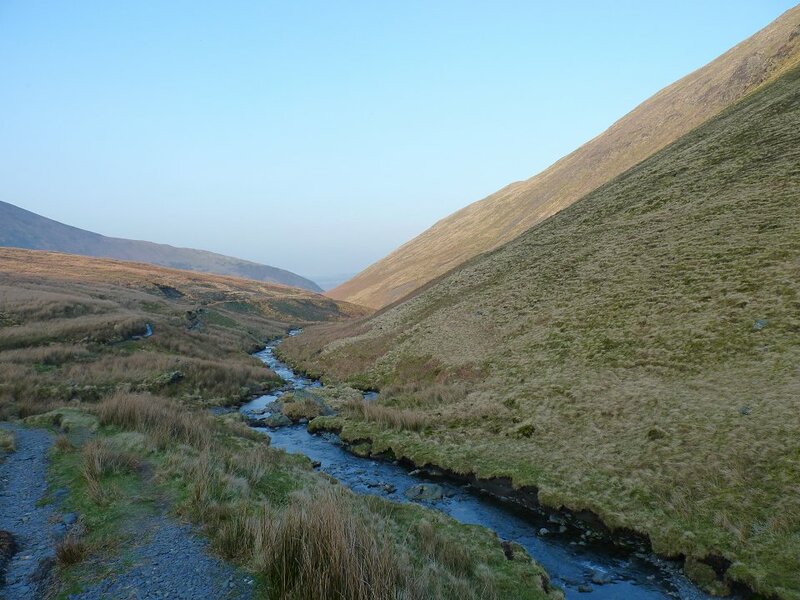 After fording (with some difficulty ) the river I set of for Carrock Fell. 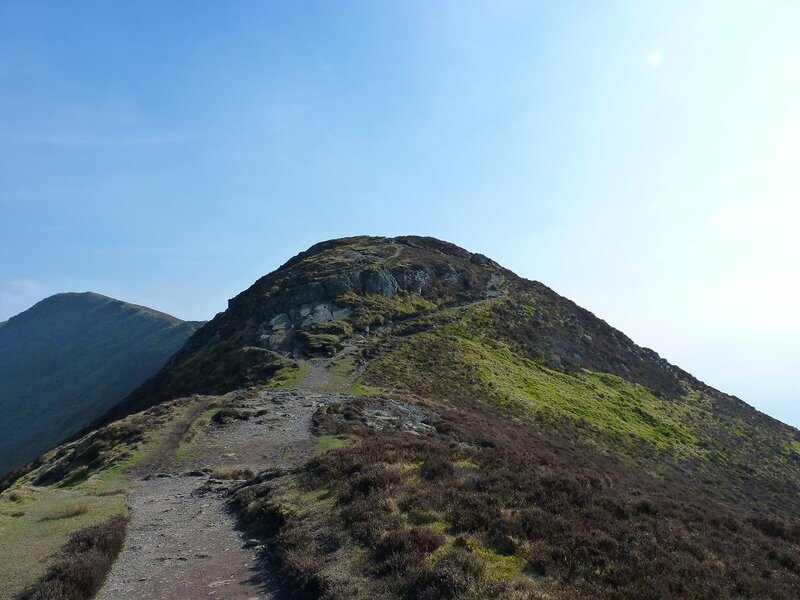 My planned route was to follow the Cumbria Way up to the ridge then turn right, but as I was descending the slope opposite down to the river, I saw that there might be a short cut up by Brandy Gill. 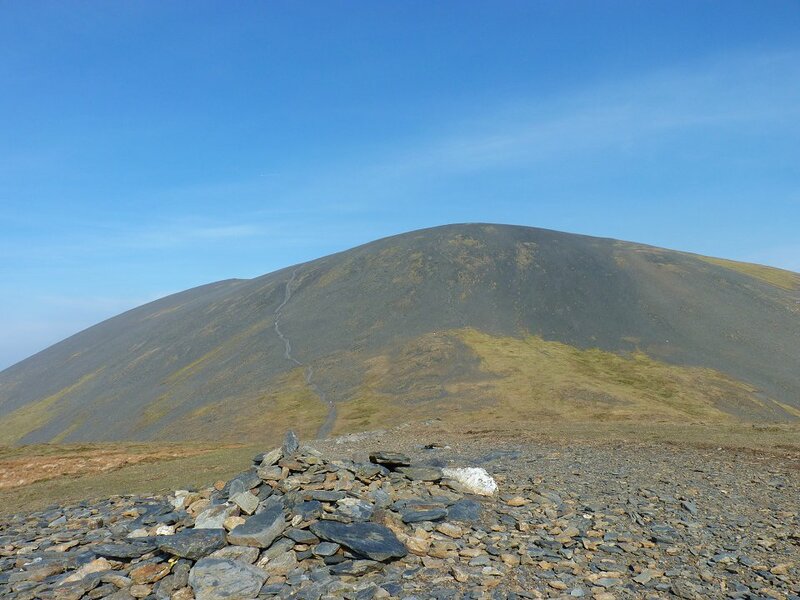 I don't know if it was any shorter but it certainly was a slog and I was glad to reach the ridge at Round Knott. 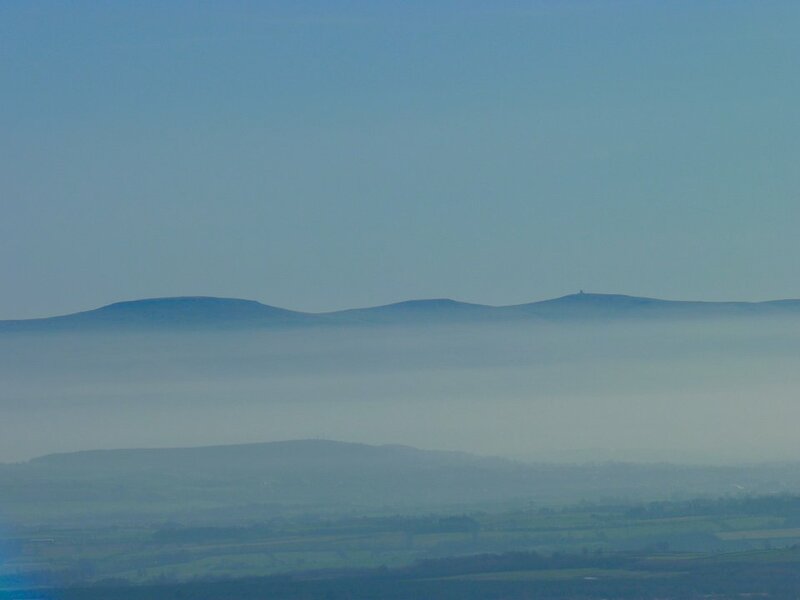 This is looking back up the river through the haze to Lonscale Fell in the centre background leading up to Skiddaw Lesser and Little Men. 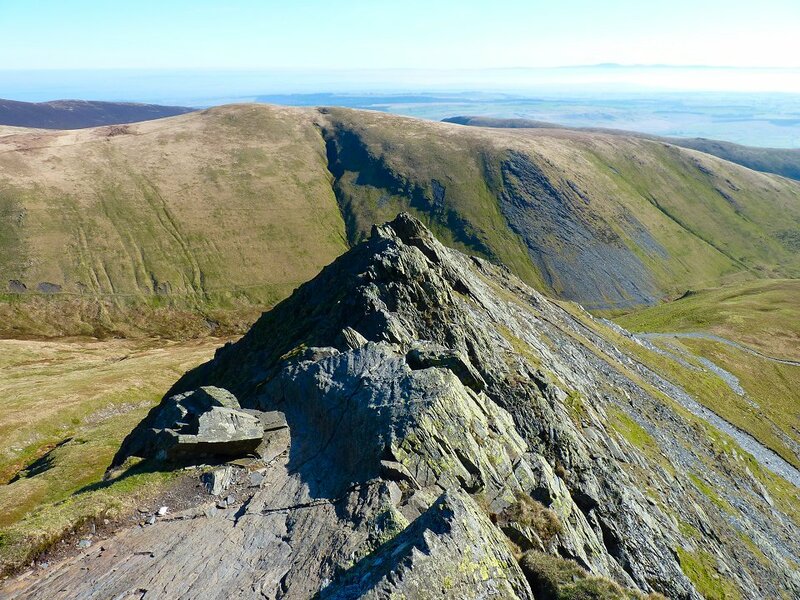 Looking back along the ridge to High Pike from Carrock Fell. 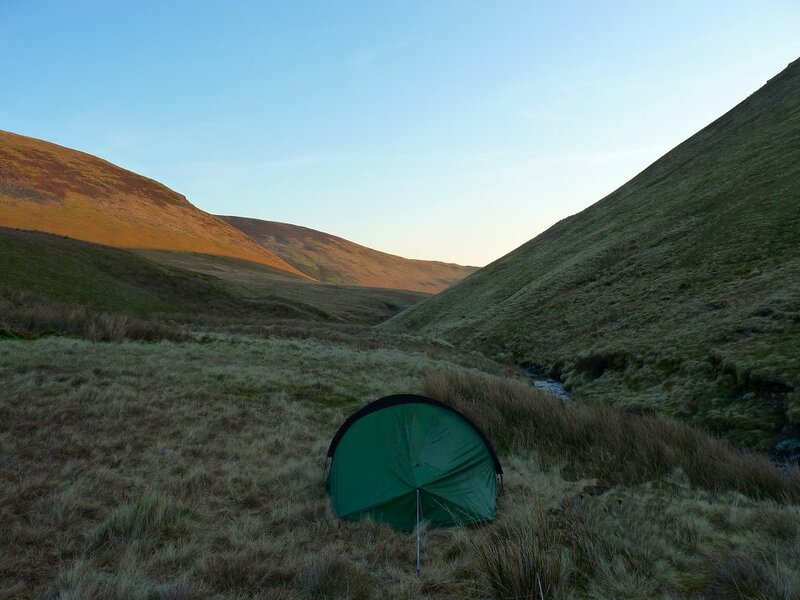 After dropping down to the road I had a couple of miles to walk to Mungrisdale village where I called in the pub for a pit stop before I set of along the River Glendermackin and looked for a place to camp. As soon as I woke I could tell the weather had changed. 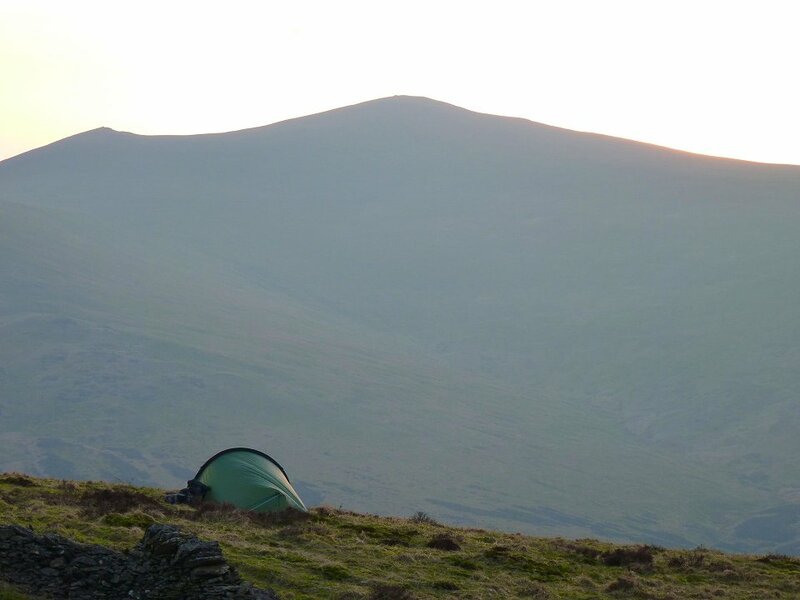 There was condensation on the tent and the air felt a bit colder and the haze had gone. It was a bit nippy as I packed up but I knew just the thing to warm me. 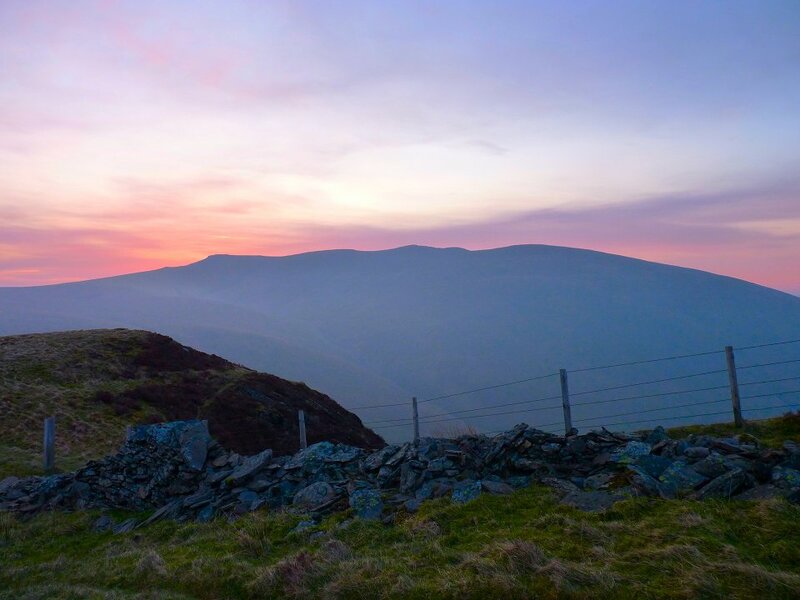 I set of up the very steep side of Souther Fell and the chill was soon forgotten as I zig-zagged up to the top. 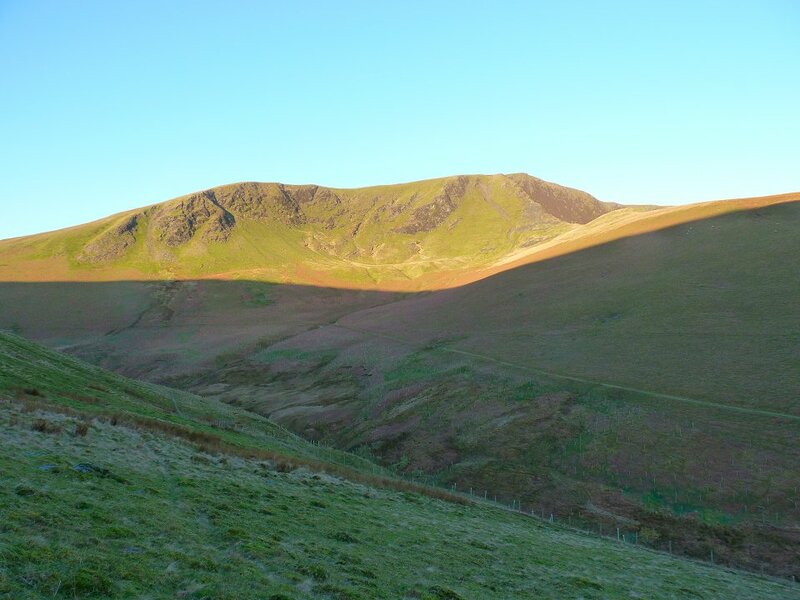 This is looking across to Bannerdale Fell from the side of Souther Fell. 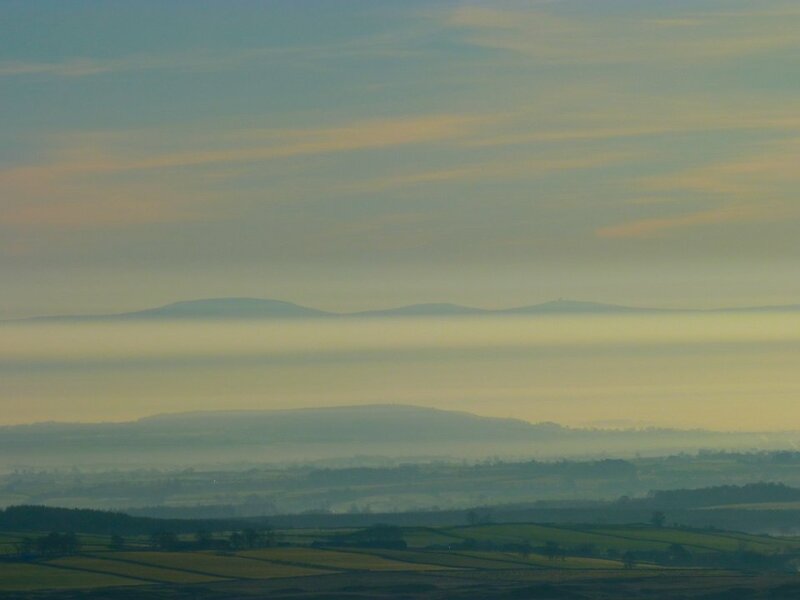 I popped up onto the ridge into brilliant sunshine and was greeted with this view of the Pennines across the Eden Valley. 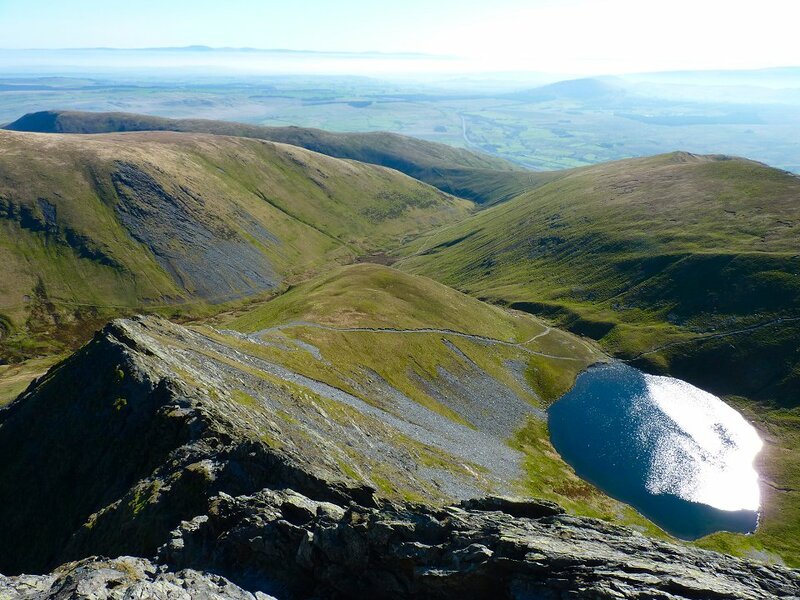 Last time I came this way I remember thinking exactly the same thing when I saw Sharp Edge. NO WAY! 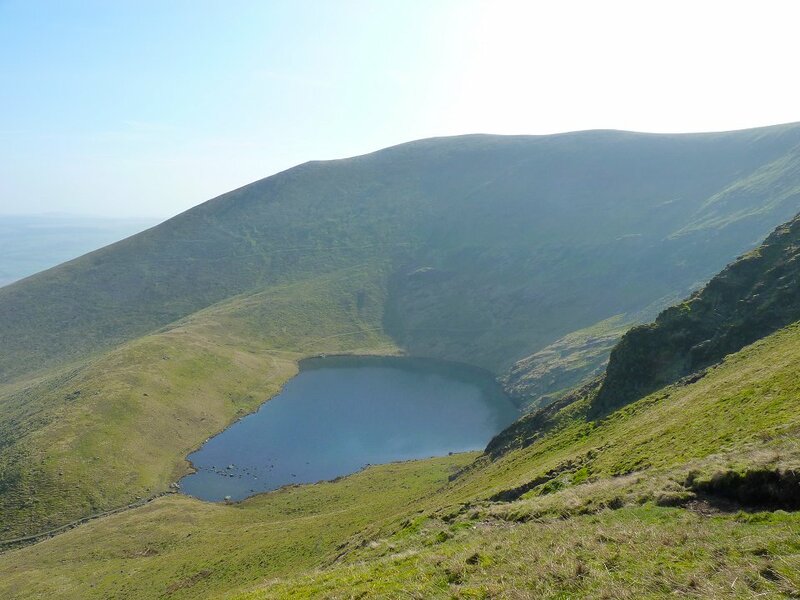 Despite my head saying "no way" my legs just kept on and before long they were both at Scales Tarn and heading up the Edge. Just before the climb starts in earnest I zoomed in what I think are Cross Fell on the left then Little Dun Fell and Great Dun Fell with the radar station visible.. 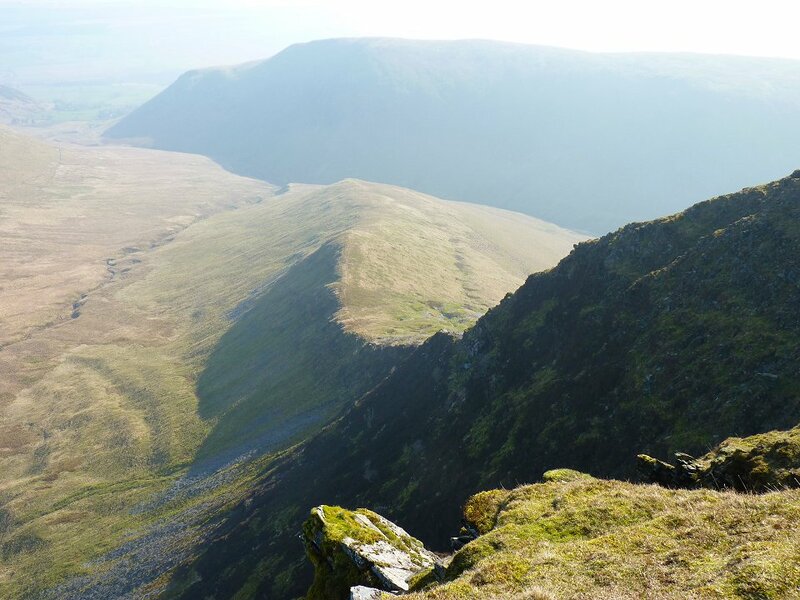 Looking back down Sharp Edge. And the view from abit higher up. I made it up without to much bother but if the rock was wet I personally don't think I would come this way. 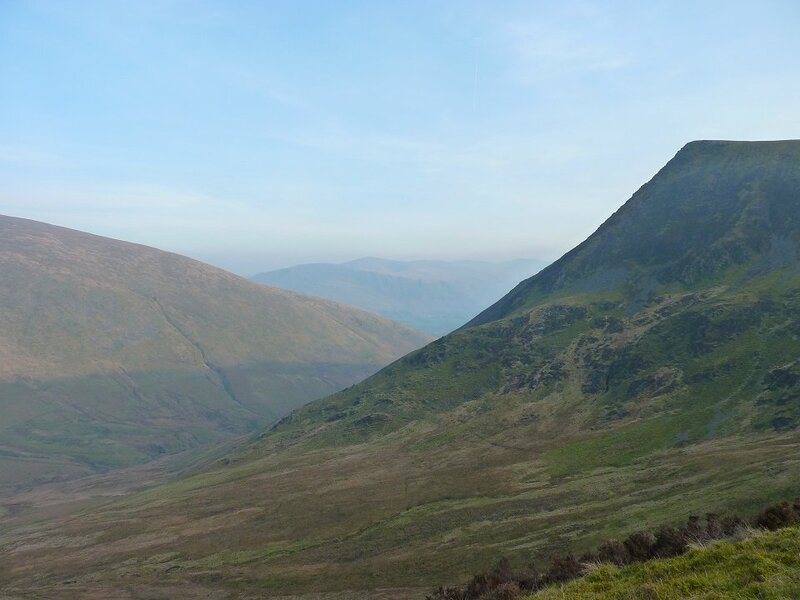 As much as I could have stayed on Blencathra all day, I had to be home in the early afternoon so I set of down by the Hall's Fell Ridge to Threkeld where I caught the bus back to Penrith.